The photograph that forms the new banner for this blog was taken at a recent meeting of the `Making Geography Happen' group. This project, set up by the Geographical Association, involves teachers from two secondary schools and three primary schools. The teachers involved have been devising and teaching geography themes designed to motivate learning and to demonstrate how good teaching `can make geography happen' in classrooms. To find out `what works' the teachers have involved their pupils in the evaluation. They have also been looking at what things help children progress in their geographical understanding. I particularly liked this Year 7 (11-12 years) project on `The school of the air' in Alice Springs. 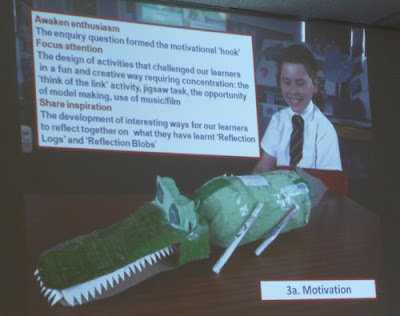 One very motivational element of the project was the final presentation where pupils were encouraged to present their `reflection logs'in any way they chose. There were crocodiles with tongues that unravelled to show the logs. Rugby balls that opened up and even a `shopping trolley'. Ideas and resources from this project will form a new section of the Geographical Association website. I'll put up a new post when the project goes online.